CABLE HIGHLIGHTS: Discovery’s GOLD RUSH was once again at the top of Friday cable, down 0.02 to 1.27, and with lead-out GOLD RUSH: THE DIRT at 0.51. ESPN’s NBA double-feature was at 0.81 (Minnesota vs. Oklahoma City)/0.51 (Cleveland vs. Houston), compared with last week’s 0.71/0.68. 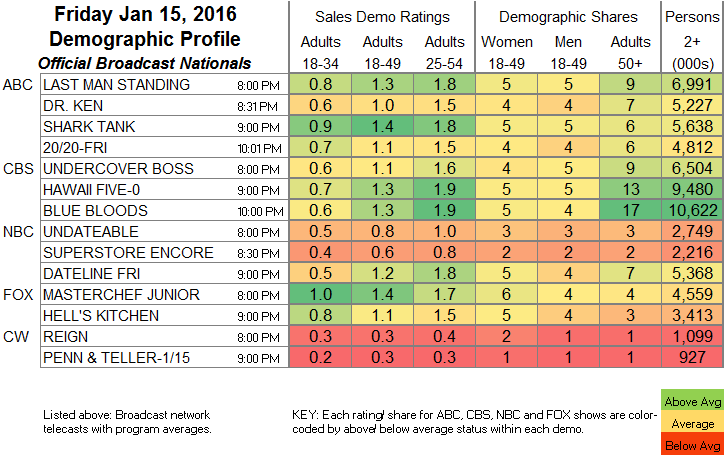 On Lifetime, THE RAP GAME gained 0.04 to 0.49, while BRING IT was down 0.04 to 0.44. Disney Channel’s 9:30AM LION GUARD episodes were strong at 0.41/0.39. On Food Network, DINERS, DRIVE-INS & DIVES was at 0.35, BURGERS, BREW & QUE at 0.33 and AMERICAN DINER REVIVAL at 0.22. We’s MARRIAGE BOOT CAMP rose 0.02 to 0.32. REAL TIME WITH BILL MAHER returned to HBO at 0.29. On History, AMERICAN RESTORATION rose 0.04 to 0.28, while SMARTEST GUY IN THE ROOM slipped to 0.21/0.17 after last week’s 0.24. 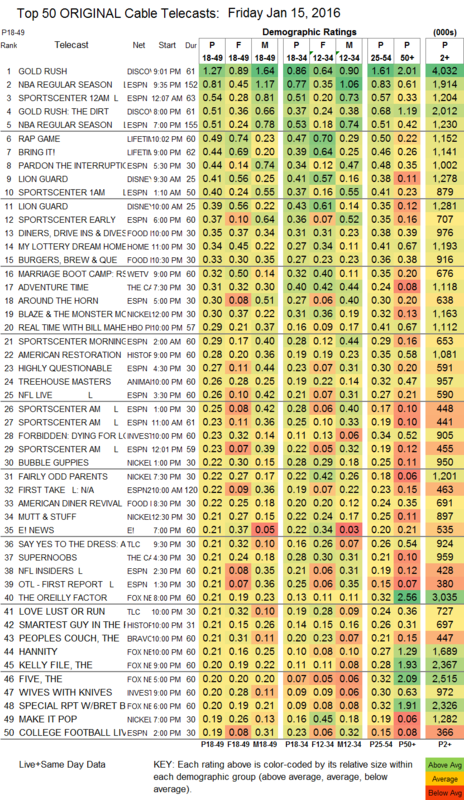 On TLC, SAY YES TO THE DRESS was at 0.21/0.18 compared to last week’s twin 0.22s, LOVE LUST OR RUN held at 0.21, and LOVE AT FIRST SWIPE gained 0.03 to 0.18. Bravo’s THE PEOPLE’S COUCH was at 0.21. 2 episodes of OWN’s LOVE THY NEIGHBOR were both at 0.18. A pair of UNFORGETTABLE episodes at A&E held at 0.13.